Pink Polka Dot Books: Broken Things by Lauren Oliver-- She's Baaaaack!!!! 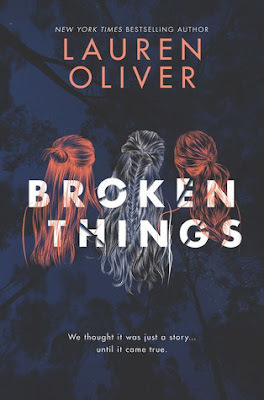 Broken Things by Lauren Oliver-- She's Baaaaack!!!! Summer was killed 5 years ago. Everyone thinks her 2 best friends did it. The shocker? The girls were only 13 during the time of the crime. Their obsession with a little-known fantasy book called The Way Into Lovelorn, made the media think the murder was some sort of fan-fiction fantasy gone-wrong. Brynn and Mia have lived under suspicion for the past 5 years. 5 years of not knowing who did it, but knowing that they didn't. They've been pulled apart-- Mia being slowly suffocated by her hoarder mother, and Brynn pretending to be an addict so she can live at rehab-- but now they may be ready to come together and prove they aren't the "Monsters of Brickhouse Lane". Lauren Oliver is BACK!!! I know most people fell in love with her for The Delirium series-- but I'm a Before I Fall girl & I've been WAITING for some kind of Contemporary/Mystery/Thriller from her for a long, long time. It's finally here!!! And it's SO GOOD!! I didn't realize this book was full-on based on true-life events, but shortly after starting it, I realized this story is very similar to the case where those girls were obsessed with Slenderman and stabbed their friend over it. It doesn't follow it exactly or anything, it just starts with a similar beginning. I'm a big true-crime fan, always watching the ID channel and I used to read tons of true-crime books, so of course I'm drawn to books that get inspiration from them. Brynn and Mia were really interesting characters. I rooted for their friendship the whole time. I could tell they cared about each other even though they THOUGHT their only real connection was through Summer. Summer may not have been in this book in the present, but I loved how well we got to know her through flashbacks and the people they talked to. She's the type of complicated girl that I love to read about-- she's that alluring/dangerous girl that people can't resist, but probably should. I'm a total sucker for girls like Summer in books. Mia was the one that really pulled at my heart because of the heartbreak she went through with Owen, a guy she grew up being best friends/hopelessly in love with. Owen had made Mia FEEL like they were going to be together, but then Summer stole him from her right before her death. Owen was originally arrested for the murder and he's also had to live under suspicion all this time. He was adorable and I loved him and I feel like Lauren Oliver writes perfect book boys just for me... okay, maybe for you too?? The side characters could've been done a little better. Mia has a new friend, Abby, that started out with so much potential-- but somewhere along the way, her development was dropped. I thought she deserved more attention. The other character was Brynn's cousin Wade. He was a "fan" of the case and came along to help them solve it-- but he was just sort of a weirdo that was THERE. I wanted him to mean something more. The ending was good, if not a little meh. I don't really "get" why the person who did it, DID it. It seemed like it was meant to be surprising, but I felt like it was just confusing and didn't make much sense. I wanted this book to do something twisty in the end, and this really wasn't that book. PS-- Is it weird that I thought that the cover was jellyfish instead of hair?? OVERALL: SO ADDICTIVE. If you love Lauren Oliver, you'll love this. I could get used to her writing Mystery/Thrillers & I hope they are all like this-- except maybe a TAD more twisty?? Broken Things is loosely based on the Slenderman Stabbing crime and I would rec it to all my true-crime & mystery lovers. Quote: "And in that moment I wonder if Lovelorn wasn't so special after all. Maybe everyone has a make-believe place. Make-believe worlds where they play make-believe people." How I got this book: Thanks to HarperTeen and ALA for providing me an advanced copy to read and honestly review. 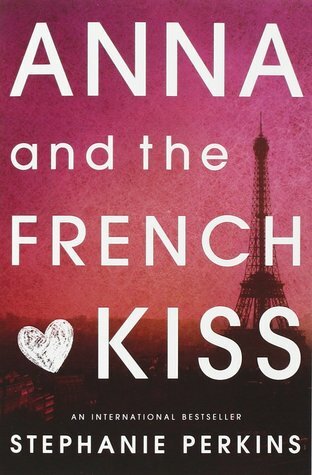 I think Mia needs a non-fantasy, "friends to lovers", cute romance book. Before I Fall is my favorite LO book, and Vanishing Girls was my second, so I was looking forward to this one, and I really enjoyed it. I had no idea this was inspired by the Slenderman girls. I think LO had to pick a character that would be off our radar, and she sort of built a case for it, so I was ok with the ending of the mystery part. But I was really happy with the very end of the book. I needed that bit of hope. When I first saw the blurb for this book, I immediately thought Slenderman - and that's super-creepy to me. It's a shame the ending didn't have a great payoff, but I'll probably still read this one! I also liked Before I Fall way better than Delirium! I didn't realize it until I read the first few pages-- but then I was like OHHHHH SLENDERMAN!!! The ending didn't kill the book at all, so I think you'll still really like it. I just didn't 100% think the reasoning was that strong with the person who did it. I'm SO EXCITED for this novel - I'm a massive fan of Before I Fall, plus I really loved Vanishing Girls, even though that one received some mixed reviews. It's a pity the ending wasn't twisty and that the motivation of the killer wasn't clear, I hate when that happens, but it seems like the rest of the book made up for that. Fantastic review! OMG Michelle SAME re: the person who did it! The writing, of course, is INCREDIBLE. Honestly Lauren Oliver could publish her daily to-do list and I'd buy the thing. So of course I cannot wait for whatever she writes next. Like a Requiem epilogue bwhahah. I tried to read this and I just couldn't get into it. Now that you say the ending is meh, I'm giving up! I still think Before I Fall is my favorite of her books!